^ Surely the caption under that photograph is incorrect isn't it? El Nino isn't an Indian Ocean phenomenon. Confused. Monthly fall (3rd Feb-7th March - i missed last weeks, hence the extra week).. Highly likely that summer will see ENSO neutral conditions. PDO for Feb is in and far from fading it is up to 1.75? Another 9 months of positives will put this run longer than any contiguous negatives since before 98'? Where would that place the PDO 'phase'? With China's coal pollution in its second year of reductions are we to see 'extra' heating of the Surface of the Pacific due to pollution levels waning? if so then we should expect another 6 months of positive PDO which would tend to suggest the lowest ENSO will fall is Neutral? After a superheated few months, the tropical Pacific is starting to cool down, one of several signs that the memorable El Niño event of 2015-16 is nearing its end. The looming question is whether this blockbuster will be followed by a sequel--which, like most sequels, could pale in comparison--or whether La Niña is waiting in the wings, ready to take the stage for what could be an extended run. Meteo France model seeing a very swift drop in ENSO. The upper ocean heat content in negative for the first time since July 2014. So that's something to keep an eye on. 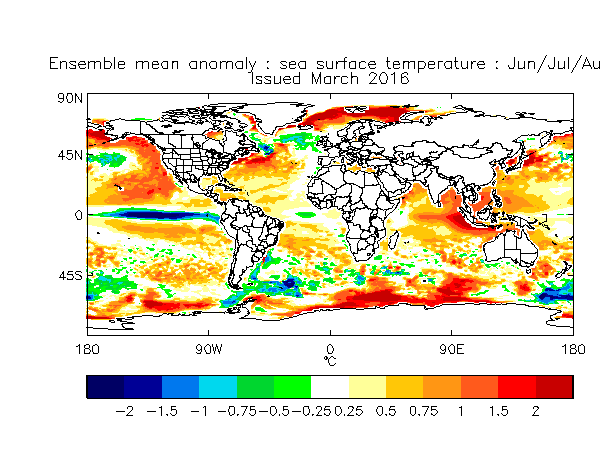 The warm water that brought about this El Nino is getting the squeeze currently, remaining only in the top 50m or so. It would be somewhat ironic (and extremely annoying) if the extreme El Nino that contributed to ruining winter turned around to a strong (-1.5 to -2.0) La Nina just in time to help ruin summer! Didn't something similar happen in 1998? I've been having a feeling summer could be wet for some time- saying that though I think we'll have some extended dry weather sometime mid-late spring which should suit a few. I'm personally intrigued by how winter 2016/2017 may shape up. Ever tanking solar activity, E'ly QBO and a possible weak nina/perhaps neutral by then? I think we're more likely to be heading for another mild winter next year unfortunately. After strong Ninos you often get moderate-strong La Ninas that last 2-3 years with double dips. The same occurred in 1973-77 and 1998-2001. They often end with an average or cool winter however (1976/77 and 2000/01), so you never know, 2019/20 might be decent. We're also in a similar place in the solar cycle as 1972/73 so perhaps that is 'closest fit'. Warmer SSTs elsewhere in the globe, higher background temperatures and sea ice amounts to the North differ to 1972/72 though, so who knows. The Nina after the Nino of 82/83 was quite weak though looking at that graph. So perhaps a wildcard. As long as we're not in strong Nina waters come December I'll be relatively happy. 95/96 was near neutral/ very weak nina so I think if we can head back towards neutral come winter we may be OK....looks possible as the first Nina peak could possibly be late summer. Another thing that could possibly go our way is the QBO could be well entrenched by then, meaning we make the most of the flushing down of the upper easterlys. As I said will be interesting. 2010 was an extreme example. The Feb MEI value peaked at +1.5 but by the following December we'd recorded the second strongest Nina on record. The key question here is whether the PDO will collapse and back it up so to speak. Winters 09 and 11 were notably cold and both had La Nina. The important thing seems to be to avoid the ENSO and QBO coupling (i.e a La Nina with a +QBO seems to be better than a GLAAM to the floor ---- everything combination). It looks like the implemented changes to the CFSv2 Atlantic SSTA, mentioned in Dr Masters' blog, has resulted in a drastic change to the forecast. Monthly change. (7th March-11th April). BOM has put la Nina into watch status. What a difference a week makes. 1.2 at 0.1C and the cold pool underneath is now surfacing. After El Nino brought NZ a very dry spring and unstable early summer (including a December record of 36C in a very up/down month), a January soaking and a very warm Feb the first two months of autumn here have been dominated by gentle westerlies then warm high pressure (late March saw four consecutive days at 30C in Christchurch) - the south is not getting a look in as anticyclones have ruled April. I read that atm a moderate to strong nina is the most likely by jan. Conditions expected to be neutral by late spring or early summer with transition towards la nina in late summer or early autumn.